E.C.M.C. is a non profit student advocacy group. Founded in 1996, E.C.M.C. is best known for its C.A.M.P. (Cultural American Multi-Disciplinary Program) which has a huge enrollment each summer and provides transportation. In addition to world-class Intensive Musical Instruction, C.A.M.P. offers Culinary Arts, Ballet, Theater, Ballroom Dancing, Art, Stomp, Film Making and much more for our local kids at a fraction of the actual cost. Concerts, theatrical productions, educational and cultural arts programs for youth and adults held at Murray E. Nelson Gov't. & Cultural Center, MM 102 bayside, Overseas Hwy., Key Largo. Formerly The People's Theater of Key West. Devoted to bringing a fresh performance presence to Key West. Visit website for information and schedule of upcoming performances. THEATER STUDY: Musical theater training...the triple threat! Instruction in dance, voice and acting as well as costume and set design. Theater for children ages 5 18 for all children in the Lower Keys. Keys Kids has produced over 70 musicals in its 18-year history and offers workshops and master classes in acting, singing, improvisation and dance. Visit website for upcoming auditions and performances. Mainstage performances in season, summer readings, gallery performances & exhibitions, film theater next door. Dance classes available such as belly Dance, tap, etc. Call for more information. See live comedy, drama, musical theater, and cabaret shows in an intimate small theater. Tickets available online! Quality theater, dance, music productions, other cultural attractions. The oldest continuing operating theatre in Florida! 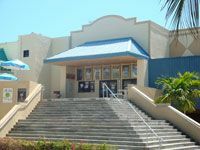 A Regional theater housed in a historic building on Mallory square presenting and performing plays, musicals and classes.